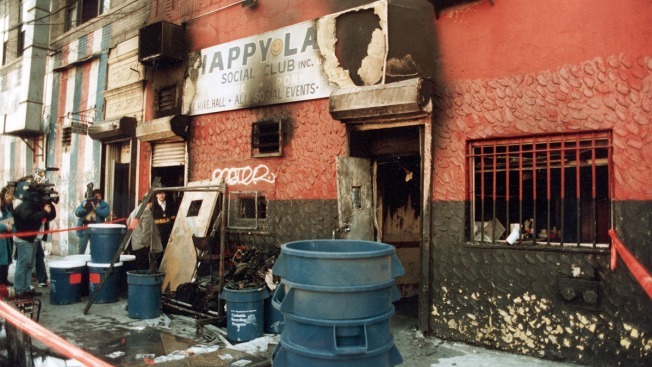 In this 1990 file photo, news crews report on an arson fire at the Happy Land social club in which 87 people perished, in the Bronx. The warehouse fire in Oakland that killed at least 36 people last week is a grim reminder of the devastating Happy Land social club fire that killed 87 people in the Bronx in a little more than 25 years ago. While the circumstances surrounding the two events were different, both are among the deadliest building fires in the U.S. in the last 50 years and involved dangerous building conditions and partying young victims. Investigators honed in on a refrigerator and other electrical appliances as possible causes of the Oakland fire, while the Happy Land fire was set by a spurned boyfriend-turned-arsonist. There have been similar questions about the cluttered warehouse in Oakland. City officials said the space was not permitted as a residential building, but lease holder Derick Almena said about 20 people lived there. Almena said the group was a collective of young artists called Satya Yuga. The warehouse had been converted to artists' studios and illegal living spaces, and former denizens said it was a death trap of piled wood, furniture, snaking electrical cords. It only had two exits and a rickety, homemade staircase, the former residents said. No one has been charged in the Oakland fire, although a criminal investigation has been launched. Last March in the Bronx, family members and friends of victims gathered at a vigil to commemorate the 25th anniversary of the Happy Land club fire. The Happy Land fire was the worst in New York City since 146 workers died in a blaze at the Triangle Shirtwaist Company in what is today's Greenwich Village. They were killed exactly 79 years earlier on March 25, 1911. In 1990, Happy Land drew a noisy, happy crowd of mostly young people. The club had been ordered closed for fire hazards — the lack of sprinklers or emergency exits — but continued to operate illegally. On March 25, 1990, a Cuban refugee named Julio Gonzalez tried to win back the woman who had spurned him. Gonzalez entered Happy Land, which was humming with people — mostly immigrants — partying and dancing. His former live-in girlfriend, Lydia Feliciano, was checking coats, and they had a virulent argument. Gonzalez was thrown out. In a rage, he returned just after 3 a.m., splashing gasoline on Happy Land's only guest exit and lighting two matches. Then he pulled down the metal front gate. Within minutes, 87 people were dead. That spring night, people were smothered by black smoke or fatally burned. It happened so quickly that some appeared like frozen figures from Pompeii. A few still had drinks in their hands. Some had torn off their party clothes, engulfed by flames. Others died hugging or holding hands. Bodies were piled up on Happy Land's dance floor in the darkness, their faces covered with soot. Gonzalez died in September of this year at the age of 61.